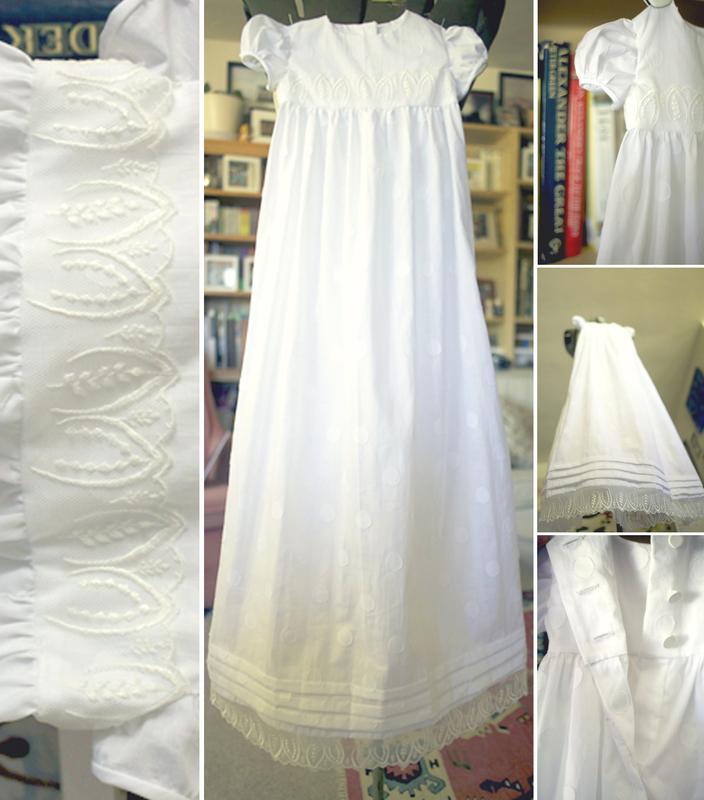 I’m entering the Christening gown that I made for my baby niece into Pattern Review’s Sewing for Children contest. I unfortunately don’t have a photo of my niece in the gown since she’s not being Christened until September and the contest ends this month. But, I’m not sure if I’d feel comfortable posting a photo of her on the internet even if I had one. Instead, I made a little montage of the dress with its many details highlighted. I began cutting and sewing this dress on July 11th. I used a gorgeous polka dotted white cotton and Mokuba white lace, which added a lot to the character and quality of the dress. I love the texture that the polka dots give to the dress. I found the pattern easy to follow, though it did take me forever to figure out how to put in the lapped seam, which allows the opening at the back of the bodice continue down into the dress. I made a few changes to the pattern due to fabric restrictions (you can make the dress from a yard and a quarter if you need! ), mainly cutting the dress pieces a wee bit narrower and adding a center back seam. I also enclosed the sleeve seam allowances by slip stitching the bodice lining in place with the seam allowances sandwiched between the bodice and lining pieces instead of machine stitching it according to the pattern directions. I would also note that adding French seams to the dress is an easy way to dress up the inside so that it matches the beauty of the outside. Finally, to help keep the pin tucks even and straight all the way across, I’d measure and mark them all carefully before you begin stitching. I didn’t and ended up unpicking then restitching the lowest because it had gotten all kinds of crooked. I would very highly recommend this pattern for an infant’s special occasion dress. Don’t pass it up because it’s so long. It could easily be shortened if the event didn’t call for 35″ of dress. Good luck – really hope you win! Your gown is gorgeous!! Thanks! There are a lot of wonderful entries in the contest, but it is always fun to try! It is a gorgeous gown! I’m sure she will look perfect and your entry is sure to get a lot of votes! Thanks! I can’t wait to see my niece in this gown. She’s growing quickly, but this gown is long enough to cover her over nearly twice! Thanks! I do hope the montage helps the judges see all of the details. So lovely- you’ve created a beautiful family hierloom! Thanks! I do hope it will become an heirloom. Though, if not, there’s enough fabric in the skirt that it could easily become an A-line skirt for my sister-in-law!